When I was over in Ambleside giving the talks for the Festival of the Fells I was asked many interesting questions about the Wainwrights in Colour project and the sketches. It became apparent that not everyone has grasped the concept about the original paintings. Three years into the undertaking I held an exhibition at Rheged Discovery Centre with the original works on show. At this time some were fully finished whereas others were in the early stages of completion. 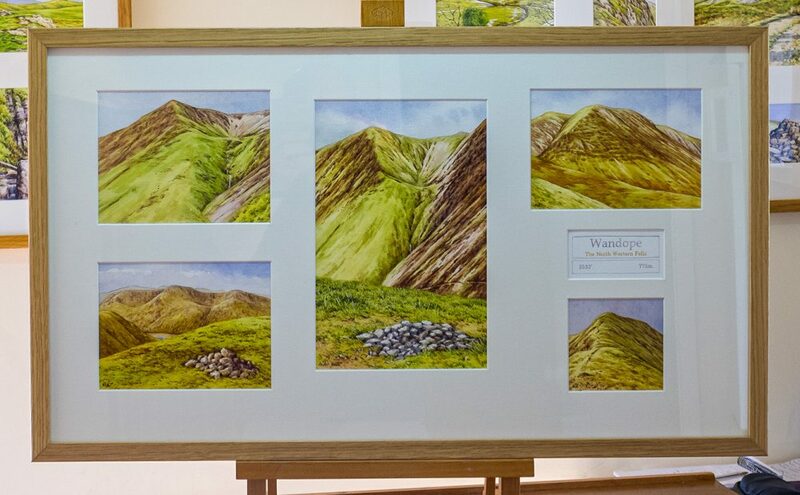 This was the only time that the original works will be on public display, over the years the fells as they have been finished have been delivered to clients and now hang in their homes throughout the country. Of the 225 original works (214 fells, 7 frontispieces and a couple of other sketches) there are now only 13 left unsold, three of which I took with me to Ambleside. These works are listed here with details of sizes and prices, I am in the process of scanning some of the sketches for these fells and as I do so I will update the pages. One of the most recent completed fells is Wandope, shown here for the first time. 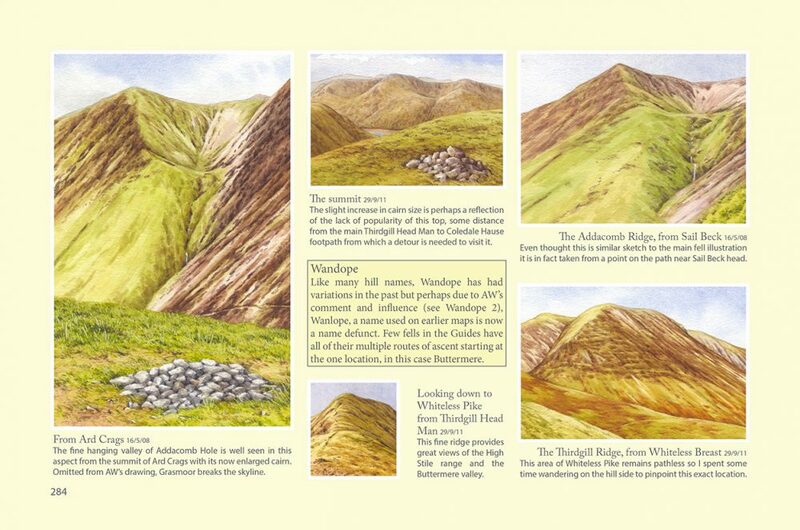 Wandope is one of the fells from the North Western region and in the Pictorial Guide Wainwright illustrated the chapter with five drawings and my equivalent watercolour sketches are shown here all in one frame as all of the 214 fells have been presented. In the framed works I placed them in a balanced order but in the book (see below) the images were laid out in an order that made the best use of the limited page size. The details on this fell, the sketches, the size and the price are shown here. On each page in the book every single sketch has an explanatory note. Apart from the original works the only way to see the 1500 sketches will either be in the limited run book or on this website. I must reiterate that there will never be any prints or copies of any of the fell sketches, it is totally impractical to do so and I feel it dilutes the uniqueness of the project. At this time there are only about 150 members of the “club” who own an original fell from the Wainwrights in Colour project (Some of them bought more than one fell) so if you would like to own one of these few remaining unsold fells then do get in touch, I imagine that once the book is published all of the original unsold works will soon be snapped up. As for the book…..I will soon be posting an update on the progress of the book. 2016 has been a very testing year. It has not been the easiest of years for us but light at the end of the tunnel now.